This summer, I attended a birthday party for Nozomi Tojo. The hosts went all out. We played Nozomi-themed bingo, hosted a birthday livestream, sang karaoke, grilled up some yakiniku (Nozomi’s favorite food), and shared a birthday cake with purple frosting—her favorite color. The hosts even set up a wall-to-wall bookshelf fully decked out with Nozomi-themed decorations and toys. However, Nozomi herself didn’t make an appearance because, as you might have guessed, Nozomi is an anime character. For those not in the know, Nozomi is a fictional idol from the 2014 anime Love Live! School Idol Project. Along with its 2016 sequel series, Love Live! Sunshine! !, the anime tells the story of two idol groups: µ’s (read: “muse”) and Aqours (read: “aqua”), with each group consisting of nine gorgeous, spunky, and driven young women. Both groups have attracted legions of adoring fans both in Japan and around the world, and you probably won’t be surprised to learn the core target demographic is straight men. Our birthday party for Nozomi painted a different picture, though. There were some men in attendance, sure, but a little under half of us, including the host, were women—and queer to boot. Our host set up this impressive display just for the occasion. I am a bisexual woman, which puts me a little outside the traditional male demographic. Y’know. Just a little bit. Still, you can find me doing all the typical idol fan things. I buy merchandise (local and imported), vote in character polls, participate in fan communities, go to convention meet-ups, attend concert screenings, and do the whole “wota” thing. Lord knows how much money I paid to get to Anime Expo and see Aqours live in 2017 (Dia’s voice actress smiled at me for a picosecond and now I think I can die happy). If that sounds surprising, it shouldn’t be: fans like me aren’t anywhere near as rare or strange as some would suspect. Actually, what I want to share is the fact that there are tons of fans like me out there, and loads more from other demographics, too. Case in point: the most significant thing I do in the Love Live community is create YouTube content about the franchise—and of my 30,000+ subscribers, YouTube estimates around 65-70% of them are female. To confirm that estimate and gain further insight for this article, I held a channel survey asking my viewers to describe their gender and sexual orientation (anonymously, of course). Of the roughly 500 respondents who specified they watched my Love Live content, a whopping 75% said they identified as either female or feminine non-binary; 18.4% identified as male or masculine non-binary; and the remaining responses were split between various other identities. Of those respondents who specified whether they considered themselves cisgender or transgender, 14.8% answered the latter. For orientation, the most common response by far was bi or pansexual with 41.3%, followed by heterosexual at 20.9%, homosexual and asexual close behind at 18.4% and 18.2% respectively, and a mix of other orientations filling out the remainder. Gender survey results in more detail. Respondents could select multiple options. Orientation results in more detail, including romantic orientations. Again, respondents could select multiple options. All of this is to say: the audience for my Love Live videos is super feminine and pretty darn gay. Even considering that female and queer viewers might gravitate towards a queer female YouTuber, I still have one of the largest Love Live-centric channels in the English-speaking sphere, regardless of gender. Therefore, I believe this survey is still a fair representation of female/feminine and queer fans in the English-speaking Love Live fanbase at large. The survey seems to be backed up by wider community demographic polls such as this one from the r/SchoolIdolFestival subreddit, which shows female fans edging out men and other genders at 50.8%. Even in Japan, while the majority of fans are male, they aren’t as big a majority as one might think. There are also at least enough lesbian fans in Japan to make Love Live’s own Eli Ayase top this poll of lesbian anime fans’ ideal girlfriends. Despite the fandom being so full of women and queer folks, though, Love Live is still popularly associated with the image of obsessive male fans. This is due in part to some male fans being persistently visible and disruptive; but even discounting them, this association sticks because the franchise still caters to straight male fans the most directly. This is especially apparent within the pages of Dengeki G’s Magazine, where the franchise originally began activities in 2010 and which still serves as a core component of the Love Live experience. As a magazine aimed at (straight) male otaku, Dengeki tends to present images of the girls that cater to a very . . . male gaze-y perspective, let’s say. This goes all the way from the project’s earliest days up to today, including a recent series of fold-out posters featuring the girls of Aqours in skimpy swimwear. The mobile game Love Live! School Idol Festival is much tamer but still contains some uncomfortably sexualized images as well, and many of the stories allow players to insert themselves into fantasy relationships with the girls, similar to many male-targeted dating sims and visual novels. While the player character in School Idol Festival is nominally female (given the all-girls schools the characters attend), this fact is never directly brought up in-game, allowing for anyone to easily insert themselves into these stories. This, combined with dialogue and UI design choices reminiscent of male-targeted visual novels, seems to imply this content is meant to appeal to male players primarily. For examples of the ways in which the anime has catered to male fans, you can read Anime Feminist’s previous Love Live article from April. School Idol Festival card featuring Dengeki G’s art. Reminder: this character is still in high school. So if the franchise caters largely toward straight male fans, then what about Love Live attracts so many female and queer fans? And more importantly: how do we as female and queer fans feel about being involved in a franchise that nominally accepts us but has not traditionally been for us? Speaking for myself: those feelings are complicated. On the one hand, I adore Love Live. I originally got interested in it because I was mildly into the game Weiss Schwarz, which features some licensed Love Live card sets. I thought the character designs looked cute and not overly sexualized, so I picked up a deck and had fun playing with it. Fast-forward through a whirlwind watchthrough of Love Live! School Idol Project and I had already become a big fan. At some point during that watchthrough, I also decided to check out the Love Live! School Idol Festival mobile game thanks to positive social media chatter. It took a couple of attempts to get into since I wasn’t used to that type of mobile game, but once I was in, I was in—so much so that I felt the need to make a video about the game to vent some of my enthusiasm. Oh, those sweet, heady days of fresh excitement and questionable graphic design. That video proved surprisingly popular, as there weren’t many other commentated videos about the game on YouTube at the time. So I ended up making another video. And another. And another. Tutorials, card scouting videos, news videos, episode vlogs, collaborations with other YouTubers, the occasional trashpost—I’ve done a lot and I still love it. Sharing so many experiences together based around this anime and game has been extraordinary, and we’ve achieved a lot of amazing things as a community. A couple of years back, I organized a project that gathered over eighty singers to cover the song “Takaramonos,” and it still tears me up to hear so many people from around the world singing in unison like that. Also, every year in November, one of my fellow YouTubers, Umidah, hosts a wildly successful Extra Life campaign that’s raised tens of thousands of dollars for sick children and always brings the community together in a celebration of creativity and support for our best girls. Another recent and stellar example of this kind of camaraderie was shown at Anime Expo 2018, when, after months of online coordination efforts between fans, a literal rainbow lit up across the crowd at an Aqours concert. Still, through all the love and good times, I can’t ignore some of the negative effects being into Love Live has had on me. For one thing, while they’re often downplayed, those male gaze-y aspects of the franchise are still there and they don’t get any less uncomfortable when they do show up. Also, there is still a small contingent of creepy fans out there who make things very awkward when I do run into them. The fact that the broad commercial strategy for the franchise pushes to appeal largely to their tastes makes their influence feel disproportionate to their numbers, too. That’s not even getting into the various channer and alt-right types either, who spout horrible misogynist and anti-LGBTQ+ rhetoric while simultaneously fetishizing the Love Live girls. Though I don’t run into them often, at times these fans make me question my involvement in the fandom at all. Thankfully it never gets bad enough to actually push me out, but seeing something that brings me such positivity generating such hatred and grossness makes my stomach churn. I have no idea what’s going on here and frankly I don’t want to know. Of course, my experiences with Love Live (positive and negative) aren’t universal. In addition to demographics questions, I asked my survey respondents if they felt their experiences differed from other fans based on their gender or sexuality, and the responses were understandably varied. 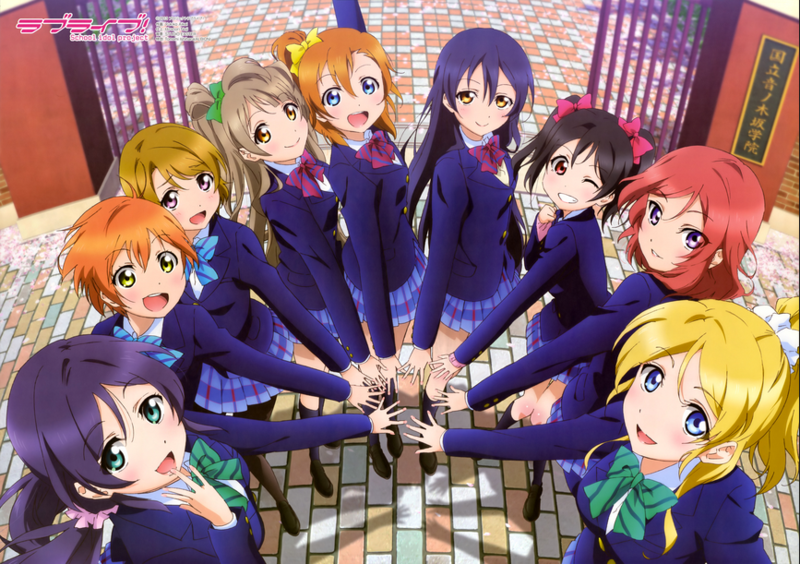 The friendships of Love Live are genuinely positive, inspiring, and well worth getting into the series for. However, many other respondents answered that they did feel their gender and/or sexuality negatively affected their experiences as fans. Below are a few of those responses. The experiences of Love Live fans who aren’t straight men seem to differ a lot based on which spheres of the community they find themselves in and how accepting and/or non-creepy the fans in those spheres are. Spheres with more women and queer folks naturally tend to have less gender- or sexuality-based conflict than those with a straight male-dominated mix. Also, regardless of the fans they interact with, different people have different opinions on how comfortable or uncomfortable they are with the male gaze-y aspects of the franchise. For many female and queer fans, those things don’t bother them at all, or their own attraction to the characters makes the attraction of straight men a moot point. For others, it can be difficult to participate in fandom when the sexualization of the girls is continually paraded in front of them, either by the franchise itself or fellow fans. For me, it won’t ever not feel complicated being a fan of Love Live, and I think that’s reflected in the responses I received. There is a lot of genuine love, support, and enthusiasm in the community, including the straight male parts of it. The franchise itself is still a lot of fun to engage with too, even if some aspects of it are uncomfortable, and I won’t be giving up my “Love Liver” status anytime soon. That said, I feel it’s important to acknowledge issues with the things one likes, even as one continues to profess love for those things (or continues to run a YouTube channel largely devoted to them, as it were). There are a lot of problems with how Love Live is presented and how certain fans treat it, and those problems do need to be confronted and discussed within the community. Thankfully though, there are enough diverse and accepting fans out there to provide a fantastic community experience overall. And in the end, I’m extremely grateful to still be a part of it. Eryn Dearden produces video essays and gaming videos focused on idols and magical girls. Her YouTube is ErynCerise, and she posts to Twitter @eryncerise. She received her Bachelor of Arts in Film Studies & English from the University of Alberta.